Make the seat high enough. This is from a practical standpoint.... That being said, if the seat post to handlebar height ratio looks even remotely close to that of a time trial bike, it is totally wrong. This was the only solution for me because the bike frame is almost 10 sizes too small for my height. As mentioned above, both the saddle and handlebars were too low. Were the handlebars high enough, the sitting position would be more upright. If the saddle were high enough, then the leg on the up stroke would not reach 90 degrees. The leg on the down stroke seems in the proper straight extended position, but I was only able to accomplish that by having terrible foot placement. 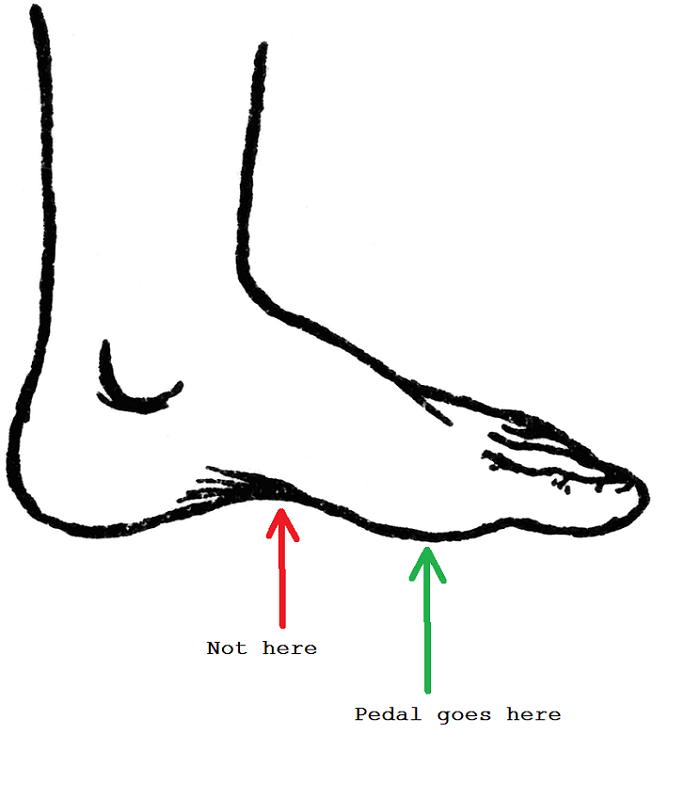 In the picture, the pedal is under the middle of the foot towards the heel. To make matters worse, I had to wear boots to ride because the sole's rigidity made it easier, and less painful, to mash harder on the pedal with this bad foot position. Fortunately, my brief time riding with toe straps forced me to correct the foot placement issue. Once the saddle/ handlebar height is all figured out, you want to be able to go fast. Fast enough to still go faster on a down hill. My old bike was geared so low that on the highest gear I would spin it out on even a moderate downhill slope. This limited how fast I could go and any extra pedaling I did was not helping. This might only be a problem with consumer sector bikes or singlespeeds, but modifying the drive train is always an option. Also on the topic of speed: the tire size. I think 700x38 is the perfect size hands down. It is narrow enough to go fast, yet I can still ride off road. 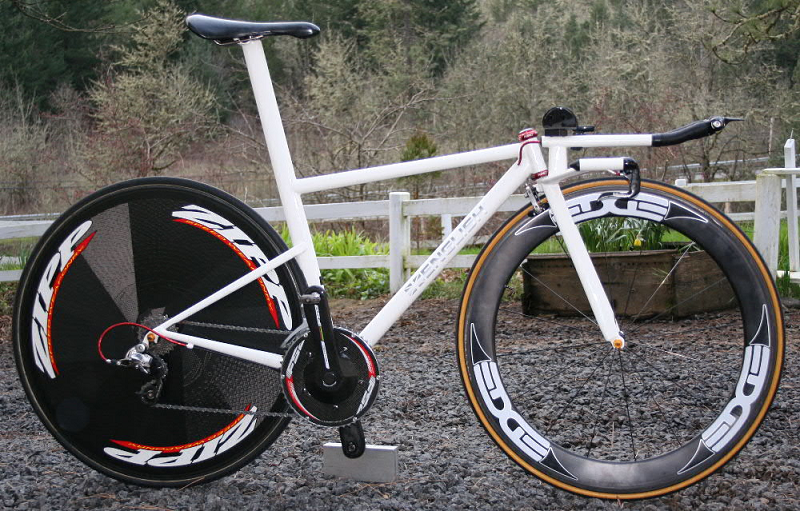 I still haven't ridden a wide tire bike with decent gearing so I don't have much authority to speak on the subject. Also be sure to inflate the tires adequately. Do not inflate to maximum pressure when it is cold. I learned this the hard way. One morning it was raining, and I decided to inflate my tires to the max of 100 PSI. Later in the day when it heated up, there was a bulge on the side of the tire and the tube was ripping through, I had to discard it. Also make sure the brake pads aren't rubbing the tires, you don't want your ride interrupted by a gaping hole in the side of your tire. Use lights at night, don't ride on the sidewalk, ride on the correct side of the road, anoint the chain with holy oil so the angels will protect you, carry a pump and patch kit, know how to get around, make sure the brakes work, DO NOT EVER BUY CHEAP CABLE HOUSING. Also, if your handlebar grips are uncomfortable and cause blisters then take the grips off an old pair of crutches like this. They work wonderful and have the bonus of not scratching cars you'd accidentally run into.